Whether you are a novice to crystals or a crystal lover I believe I can give you a new angle on how to work with crystals and in what way you can incorporate them into your every day life, making it easier and more enjoyable for you. These gemstones are alive in a different way! They radiate energy. I absolutely love working with them. I most enjoy designing jewellery, when I make it as a customised order for someone. So I can tune into their energies and use the crystals that work best for them. Have a look at some of my jewellery on ETSY HealingGemsJewellery! Do you feel helpless when you get emotionally or even mentally overwhelmed? Do you tend to be away with the fairies, not being able to focus and do your work effectively? Do you feel drained after a simple shopping trip or attending an event? Maybe you could do with strengthening your self-confidence muscles?.. Stop the feeling of helplessness and come down to Earth! Feel energetically protected in crowded places! Feel Confident! Yes, there is a crystal for that too. I made them out of whatever I’ve found in the house: coloured paper, apple seeds. sunflower seed pods, and eventually glass beads. A few years later I designed, created and sold my own beaded jewellery. 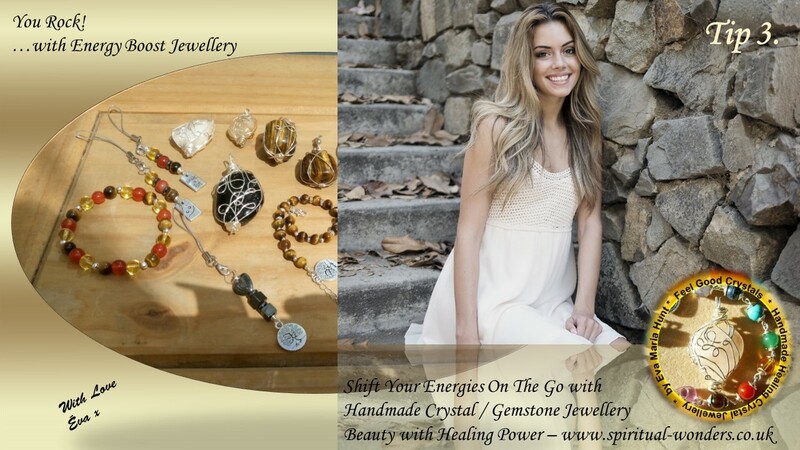 I worked on and off for almost 2 decades with fashion jewellery… Then my life has changed and all of a sudden I was attracted to energy therapies in the form of Reiki healing and crystal healing. This was the point, when I hopelessly feel in Love… with semi-precious stones. And there was no going back! like Reiki Therapy, Crystal Healing and my Energy Coaching work too, when I help women to find their real self worth and help them become who they really are. So the crystals offer a fun and easy way to help maintaining your energy vibration, the higher the better. Fill in your name and email address and find out more about how crystals can easily fit into your life. You will receive two FREE downloads. A pdf with a helpful list of crystals for 3 different situations and an audio file with a grounding visualisation, so can experience how it feels like to be energetically grounded. I can tell you it’s a quick shift and feels great! You do not want to miss your chance of having crystals as your every day companion, just because it’s not handy to have them with you. 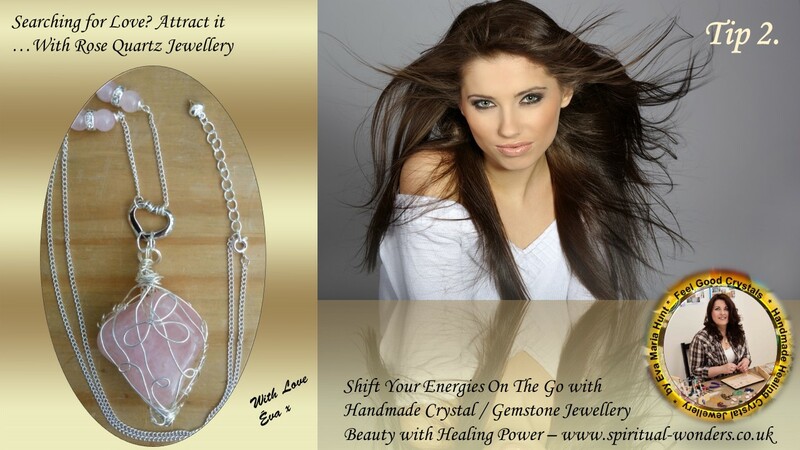 When you wear my crystal jewellery the best thing is the crystals do this work for you, or you can combine the two for best results. 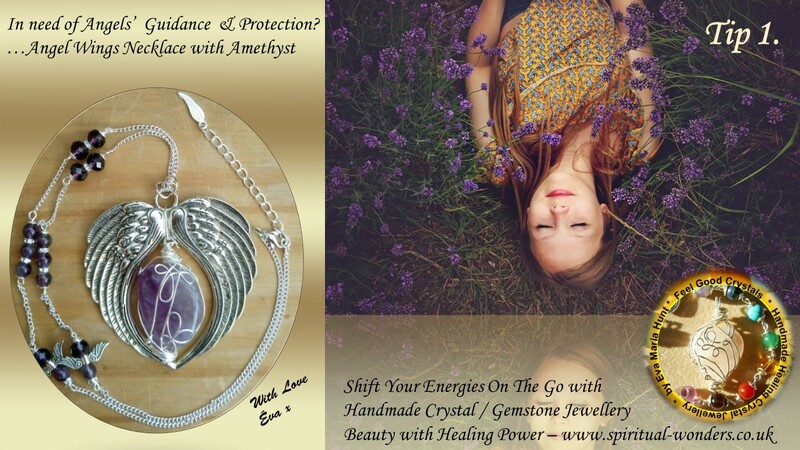 Stop Energy Drain, Balance Your Emotions, Feel Confident with my handmade gemstone jewellery!